Are you trying to save a little money when it comes to servicing your car in San Antonio? Take a look at these great car service and maintenance coupons. Keep your car and wallet happy at the same time! Just print one off and bring it in today! 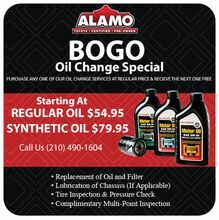 Purchase any one of our Oil Change service at regular price & recieve the next one free. Coupon not valid with any other offer. Must present coupon at time of purchase. Limit one coupon per person. Coupon does not apply to prior purchases. Other Restrictions may apply. Void where prohibited. Plus additional tax & shop supply fees. Valid at Alamo Toyota. See dealer for complete details. Toyota vehicles only. Other vehicles may be extra. Coupon not valid with any other offer. Must present coupon at time of purchase. Limit on coupon per person. Coupon does not apply to prior purchases. Other restrictions may apply. Void where prohibited. Plus additonal tax & shop supply fees. Not valid with any other offers. - Replacing the antifreeze at regular intervals can help prevent overheating, freezing, and premature cooling-system corrosion. 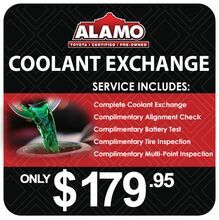 Come in for a FREE brake inspection with Alamo Toyota. Vaid at Alamo Toyota. See dealer for complete details. Toyota vehicles only. Other vehicles may be extra. Coupon not valid with any other offer. Must present coupon at time of purchase. Limit on coupon per person. Coupon does not apply to prior purchases. Other restrictions may apply. Void where prohibited. Plus additonal tax & shop supply fees. Toyota models only. Excludes tires and oil/filter change. Limit one coupon per person. Price plus applicable taxes and fees. Coupon must be presented at time of purchase. Not valid on prior purchases. Cannot be combined with other offers with any other coupons, discounts, or promotions. No cash value. Other Restrictions may apply. Void where prohibited. 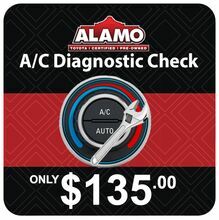 Valid only at Alamo Toyota. See dealer for details. 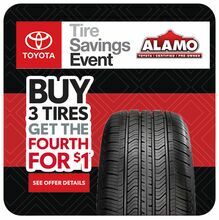 This spring, Toyota customers can buy 3 tires and get the fourth for $1 when installed on a Toyota vehicle. Speak with your Assistant Service Manager for details. * Restrictions apply. See participating Toyota dealer for details. Offer valid on eligible OEM, OEA and WIN BF Goodrich, Bridgestone, Continental, Cooper, Dunlop, Falken, Firestone, General, Goodyear, Hankook, Kumho, Michelin, Nexen, Nitto, Pirelli, Toyo, and Yokohama tires only. Tires must be dealer-installed by May 8, 2019. Three tires at regular price, fourth tire for one dollar. Fourth tire must be of equal or lesser value. Excludes mounting and balancing, sales tax, shop supplies, tire disposal, and other applicable taxes. Excludes previous purchases. Toyota and Scion vehicles only. Offer only available at participating Toyota dealers. Offer valid March 29 – April 30, 2019. TINT YOUR CAR AND SAVE $25.00 TODAY!! Speak with your Assistant Service Manager for details.